The Aaland Islands is a case in point, as are South Tyrol, Trieste, Andorra, and Northern Ireland, each of which was contested by neighboring countries. Finland and Sweden both coveted The Aaland Islands; South Tyrol was in dispute between Austria and Italy; Trieste was divided between Italy and Yugoslavia; Andorra is a small principality. Virtually all of these cases, the country in question was seized or split in two in the course of the war between neighboring countries. Finnish people are often called the white Eskimos. They have a nomadic oriental heritage (by some historians regarded as “the lost tribe of the Mongols”). They shared a common heritage with other people who had settled around the Baltic Sea, including Estonia and Hungary, known as the Finn-Urgics, whose origins were rooted in the Ural Mountains of Russia in a marriage, literally, by Ghengis Khan, leader of the Mongols, to a young teenage Hun bride. The Ural Mountains had been settled by the Mongols during the rein of Ghengis Khan, occupied then by the Huns, a people who had migrated north from the Middle East, a people said to have originated in one of the Abrahamic tribes. A little more than a year later, Russia forced Sweden to secede Finland on September 2, 1809, in the Treaty of Fredrikshamn. Under the Russians, Finland became the autonomous Grand Duchy of Finland, allowing them a certain amount of political power in return for the advantages of access to the sea. The Aaland Islands, occupied by Swedish people, was severed from its ties to family and relatives, and made a part of the duchy. That declaration created then a new power struggle and civil war in Finland to fill the vacuum between conservative pro-Finnish “Whites” and a communist faction in the labor movement that was pro-Bolshevik and pro-Russian who was known as “Reds.” Aside from such political differences, independence had also been spurred by Russian Tsar Nicolas II’s plan for the “Russification” of Finland, which imposed serious cultural, language and religious restrictions on Finnish traditions from 1905 on. Russia’s attitude toward the Finns was identical to current Indian attitudes toward Kashmir. The tsar intended to abrogate their autonomous status and incorporated them fully into the Russian state. By means of a petition and supported by more than 96% of the population, they then petitioned the new government of Finland and proposed seceding from Finland, joining Sweden, to come under Swedish government control. The Swedish government, however, was not uniformly excited by the prospect or concerned about the Aaland Islanders or their interests for reasons having to do with internal politics more than anything else. The ideological struggles taking place in Russia and Finland were causing disarray in the execution of policy in Sweden as well. As such their support for the petition was weak, and as a result, it was less of a dispute between Sweden and Finland than a dispute between the Aaland Islands and Finland. It is with a feeling of profound disappointment that the Swedish nation will learn of the Resolution of the Council of the League of Nations. In supporting the cause of the people of the Aaland Islands before Europe and the League of nations, Sweden was not influenced by the desire to increase her territory. She only wished to support noble and just aspirations and to defend the right of an absolutely homogenous island population to reunite itself to its mother-country, from which it had been detached by force, but to which it is still united by the ties of a common origin, a common history, and a common national spirit. This population has declared to the whole world its unanimous wish not to be bound to a country to which it had been joined by force of arms alone. The Swedish Government had hoped that an institution, which was established to assist in the realisation of right in international relationships, would have favoured a solution of the Aaland question in conformity with the principle of self-determination, which, although not recognised as a part of international law, has received so wide an application in the formation of the New Europe. It had hoped that the Aalanders would not be refused the rights, which have been recognised in respect of their Slesvig brothers, who belong, as do the Aalanders, to the Scandinavian race. It had hoped that, in the very special case under consideration, in which right appears so evident, and in which the wishes of the population have been expressed with such unusual unanimity, the League of Nations would have filled, at least on this occasion the role of the champion and defender of right, and thus, by its first decision, would have proclaimed the dawn of a new international order. To-day, when the decision of the Council has frustrated that hope, the Swedish Government is obliged to express the fear that the Council has grievously shaken the confidence that the peoples, particularly those who, like Sweden, have long been striving to accomplish international law, have had in the League of nations – an institution great task entrusted to it by the Covenant, it is absolute necessary that it should possess that confidence. The Swedish Government is not of opinion that the settlement of the Aaland question which is suggested by the Council is likely to confer upon the Baltic area the peace that is desired. Nor yet is it of opinion that a population as homogenous as that of the Aaland Islands, of whose wishes so little account has been taken, can add to the strength of a country to which it is attached against its unanimous desire. The view that power originates, proceeds from, and is vested in government over and above the wishes of the people, whether minority or majority, is deeply flawed. There would be no government without individuals who form compacts with others around them for a common defense, for a means of establishing mechanisms and networks for producing and exchanging goods to better livelihood, and for maintaining peace and order. We are not bound to such social contracts by the will of the government we have created. The government serves at the pleasure of those who have created it. Only individuals make contracts, not groups. There is no legal entity called “we” or some collective consciousness that usurps my individual will to be taken over by the state or some private society. My Facebook friends have not committed me to an agenda simply by virtue of being in an association with them, nor has a society. The government has no mind of its own, no will of its own, no power of its own. It exists for me solely because I acknowledge it in my affairs and consent to its decrees. It has no intrinsic need for self-preservation over the wishes of the people it serves. It is we who preserve it. Does it make sense to build a computer that takes over our lives, or should the computer serve simply as a tool to be used for a narrow set of needs? As James Madison wrote, “the people are the only legitimate fountain of power, and it is from them that the constitutional charter, under which the several branches of government hold their power, is derived. Federalist No. 49 (February 2, 1788). In South Asia, the conflict here too, is primarily between Kashmir and its occupying power. 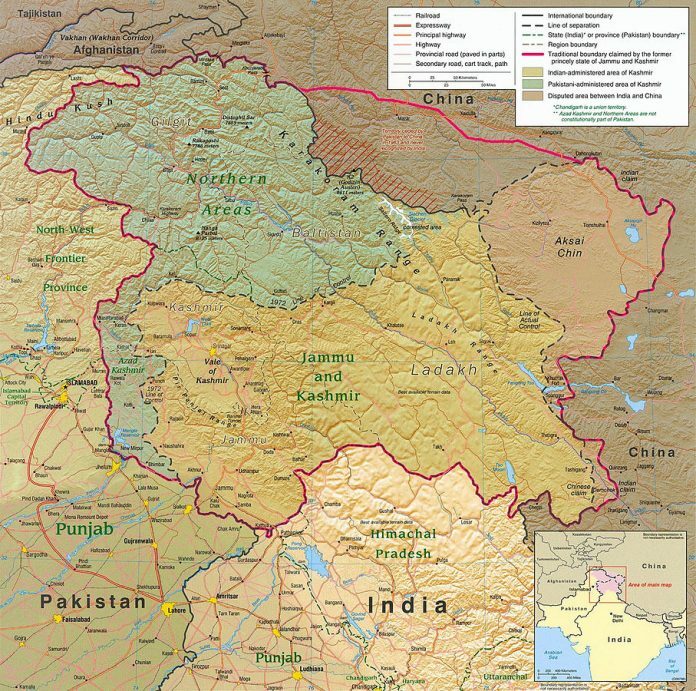 There are three parties to the dispute – India and Pakistan and the people of Kashmir. But Kashmiris are the principal party to the dispute. While Pakistan has supported UN resolutions which call for a plebiscite to be held to determine the wishes of the people. India, of course, will have nothing to do with it. India takes the view that the state is something tangible to be defended for its own sake, which includes land as well as people. State boundaries are merely fictitious and imaginary lines drawn on a map. The real state boundaries include only a coalition of the willing.